I should have listened when people told me their stories of enormous piles of zucchini, of eating zucchini day in, day out all summer, wild tales of “drop and run” actions by neighbors who can’t get rid of their zucchini either, and so on. But I did not. I had two zucchini plants last year, both in a pot. They grew a few little zucchini, most of which turned yellow at the end and rotted away. My yield was minimal, enough for one dinner of my mother-in-law’s famous and delicious ‘zucchini patties’. 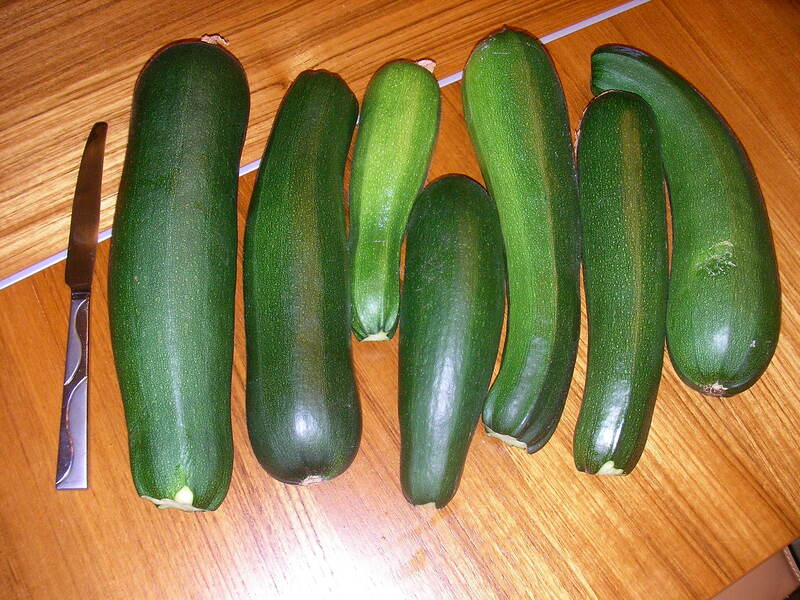 So this year I planted five zucchini plants, in the ground, with extra miracle grow and on the irrigation system. Oh yeah, people warned me… but did I listen? No. Zucchini soup, zucchini patties, zucchini stuffed with lamb, zucchini meatloaf. And then today, only four days after harvesting all the big zucchini, with nothing over 4 or 5 inches left on the plant before the weekend, I went to check again. See the picture below for the results of four days worth of growth. That is a full size dinner knife next to it for comparison. And there are a number more just slightly smaller than the smallest in this picture. *sigh* what am I going to with them now? “Drop and run?” Friends? Neighbors? The homeless? And with a lot more on the way, we’re leaving for Indiana in ten days, so we can’t harvest anymore after that… I think we’re having a zucchini vegetable stir fry tonight, with meat stuffed zucchini, and zucchini patties for the ‘carbs’.